Following these simple steps will help keep your purchase looking new for longer. Using a hot water extract method, your carpets should be cleaned every 12-18 months by a professional carpet cleaning company. 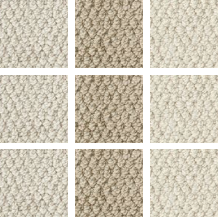 Experienced, professionals have the proper equipment and requisite knowledge to extract micro from you carpet. Professional cleaners will also be able to recommend the proper cleaning procedures based on the type of carpet you have chosen. Should you decide to do it yourself...Investigate the different equipment and products available for cleaning. Always remember to try a small area in order to properly assess your progress. Additional information is available from the Institute of Inspection Cleaning and Restoration Certification (IICRC) at www.iicrc.org They will be able to offer you information and a local professional cleaner in you area. Keeping your new floors looking new is easy. Following some simple steps will help. Always use the floor head on your vacuum. Using the power head unit of your vacuum will scuff the surface of your floors. Humidity in your home should be maintained within manufactures recommended levels thoughtout the year. Do NOT use any harsh chemical cleaners. Be sure to read all labels on cleaning products in order to maintain the luster finish on your floors. Occasionally wipe the floors with a damp mop or cloth. Avoid using large amounts of water for cleaning.